It seems pollsters have just decided to ignore British Columbia this time around, except of course Mainstreet Research. To add insult to injury, there were polls done in other provinces (for Ontario) or at the federal level. Also, I'd like to rant quickly about some of the stuff we see labelled as "polls". First of all, there is the "News1130/PlaceSpeak Poll" where people can simply go and voluntarily declare who they intend to vote for. Look, it's an online poll. They can try to make it look better by writing stuff such as "PlaceSpeak's unique location-based technology is pioneering a new model for real-time polling within electoral districts (ridings)", it doesn't make it an actual poll with proper sampling and weighting. I mean, come on, we already have enough people criticizing well done online polls, let's not start doing what 1130 is trying to do. The worst part is when you read things such as "... require more [responses] for a representative sample". No no and no. It doesn't matter how many responses you'll get, it's not gonna be a representative sample. I'm baffled with what I see here and News1130 should quite frankly be ashamed of themselves. Then we got an actual poll in the riding of Kamloops-North Thompson made by Justason. Except this survey only has 239 observations. I know riding polls tend to have smaller sample sizes, but 239 is just too small. And as they did with their already small sample for their latest provincial poll, Justason then goes on and breaks down the results by age, gender, etc. Again, come on! You can't publish results based on literally 10-20 observations by group. You are losing credibility. Oh, by the way, there seems to be a Communist surge in Kamloops with the candidate of this party pointing at 8% (actually 13% among men!). I'm not even sure what to do with this poll here. The numbers don't match the projections but the sample size is so small that the margins of error are huge. Let's just put it as "the Liberals might be higher -at least in the interior- than what the polls are showing? I guess. Good enough for me. Ok, let's go back to the projections. I decided to take a look at the uncertainty that exists and the possibles outcomes for each party. The first graph shows the possible seat distributions for all three parties (I put the Green on their own graph because the x-axis is very different for them). As you can see, the BC NDP is favourite at this point but the BC Liberals are still in this race. How could they still win? The polls could underestimate them (as they did last time; Remember that polls aren't perfect). Or the Liberals could have a more efficient vote. Both possibilities are included in my simulations. Still, make no mistake, even though polls can be wrong, it's still better to be ahead in them than trailing. Keep in mind though that we literally only had two polls in the last 10 days, so the poll average is likely not as accurate as I'd like to be. 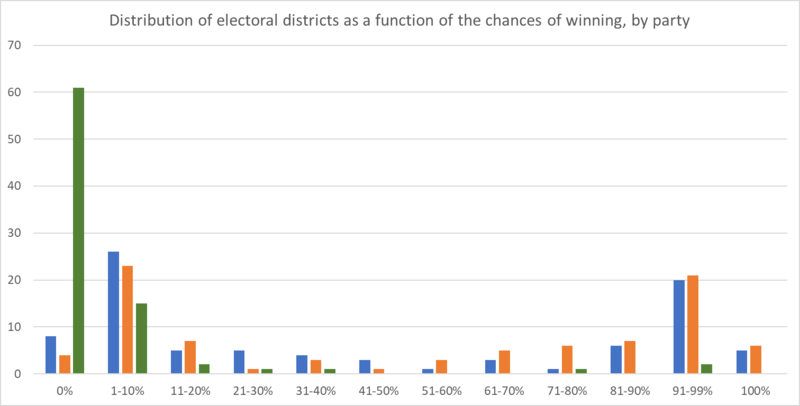 Because British Columbia still mostly has only two major parties (sorry Green voters, you might change that this election), the distributions show that both a Liberals and NDP majority is possible. I know it sounds like I'm trying to cover all the bases as not to be wrong, but this is really just what it is. Given the usual accuracy of polls and the fact that transposing voting intentions into seats is not an exact science, there is more than enough uncertainty that both outcomes are possible, along with some minorities and even ties. Anybody claiming to know for sure what will happen is either lying or delusional. 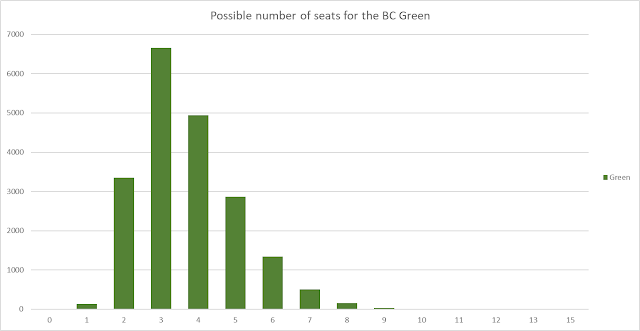 As for the Green, their distribution is heavily concentrated around 3-4 seats. There is a best case scenario of 9 or 10 -even 11 actually- but they are highly unlikely. This is why I'm a little bit puzzled by the UBC prediction market that was giving them as many as 10 seats yesterday. As I'm writing this, it's 7 seats and 17.3% of the vote. Unless the Green party manages to concentrate its increase in these 7 ridings, I'm a little bit skeptical. Yes Weaver did well at the debate but winning seats under our electoral system is still a hard task for smaller parties. Finally, let's look at how many ridings are safe for each party. There are very few ridings with no uncertainty. 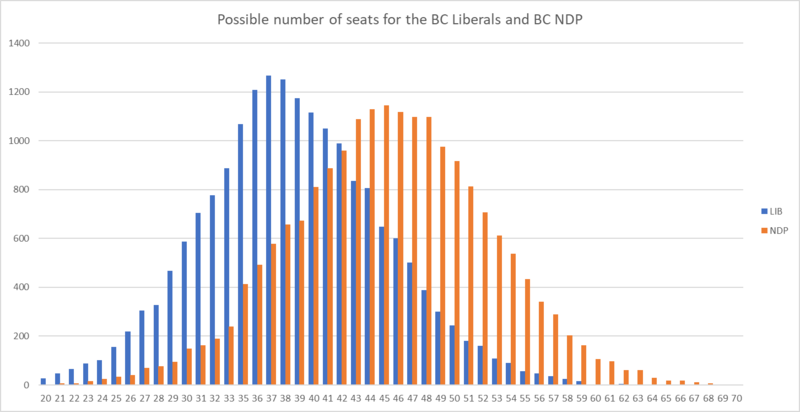 The BC Liberals currently have 5 ridings where my projections give them 100% chances of winning while the BC NDP has 6 seats in this situation. I'd like to remind the readers that the model has not made a mistake yet while projecting a candidate at 100%. The Green party has absolutely no chance in a large number of ridings (61 to be exact). There as well, I have never made a mistake when projecting someone at 0%. It came close (some candidates with like 0.5% chances ultimately won) but technically haven't made a mistake yet with the current model. The last graph shows what kind of lead the NDP currently has. Yes they would likely win more seats but many of them are not guaranteed. They simply have an edge with the number of seats projected with 60-80% chances. 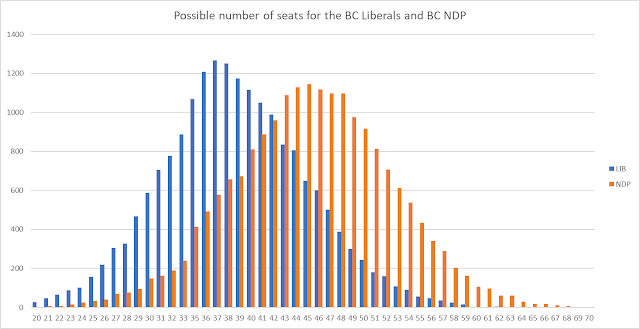 This is good news for John Horgan but this is the type of seats you can easily lose if the polls are slightly wrong. If you look at the projections, you'll see that a 75% chance of wining usually means a 5-6 points lead. Don't think this is ultra comfortable. That's all for now. Remember that advance voting starts today. So if you already know who you'll vote for, you can do your civic duty now and relax on May 9th.